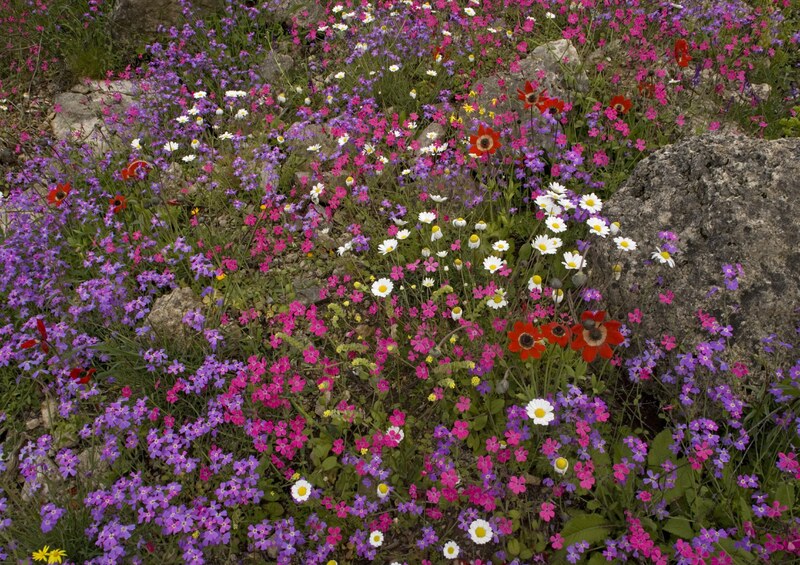 Author and photographer, Bob Gibbons suggests this is the perfect time for a trip to The Mani Peninsula to see amazing displays of wild flowers. There’s a remote peninsula in the far south of mainland Greece that still, after more than 20 visits, seems to me like a little bit of paradise. It’s the central peninsula of the Peloponnese, pointing, like a bony finger, southwards towards Crete and Africa, and when you’re there it feels like the end of the line. The whole Peloponnese is a strikingly mountainous land, wild and unspoilt; just to reach the Mani, you have to cross the highlands south of Tripoli, and running like a spine down the Mani itself are some of the highest mountains in Greece. It’s a harsh land, with bare limestone, drystone walls and cliffs everywhere, and if you were to only visit in high summer or early autumn, you would think it was a sterile land, too. But come in late winter or spring, between February and May (and my very favourite time is the end of March or the first week in April) and it is one of the most spectacularly flowery places in Europe. 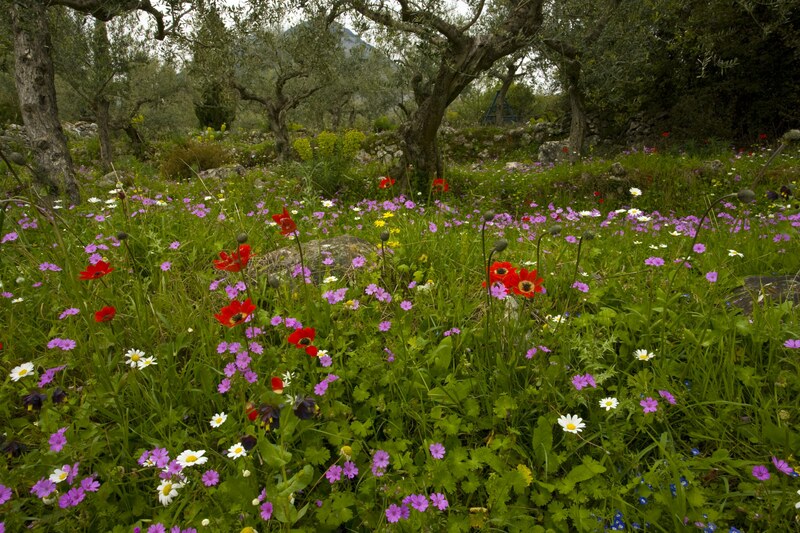 The ancient olive groves, unspoilt roadsides, rough fields, wild hillsides, cliffs and churchyards are all ablaze with flowers, from blue vetches and pink cranesbills to intense yellow-green spurges, scarlet tulips, and dozens of species of orchids. It’s an endless visual feat if you’re lucky with the season and the weather (every year is different, and the very best is a wet winter that warms up in late March as the hours of sunshine increase) that takes your breath away. Beautiful flowery old olive groves in spring, with Peacock Anemone, cranesbill etc on the Mani Peninsula, Peloponnese, south Greece. But the wonderful thing about the Mani is that these botanical riches drape themselves over a spectacular land that is rich in history and the long interaction between man and nature. There are prehistoric terraced fields from a wetter past, extraordinary numbers of gorgeous little byzantine churches often hidden away in olive groves or on rocky promontories, and lovely villages scattered up the mountain slopes. Perhaps the strangest features, to be seen everywhere – though many are now derelict – are relics of the Mani’s dynamic war-torn past. Two groups were at each other’s throats for hundreds of years and, because they often lived in the same villages as each other, they constantly strove to build higher houses than their enemies’; the result is the extraordinary Mani tower houses, which point rigidly skyward in even the most barren and remote landscapes. 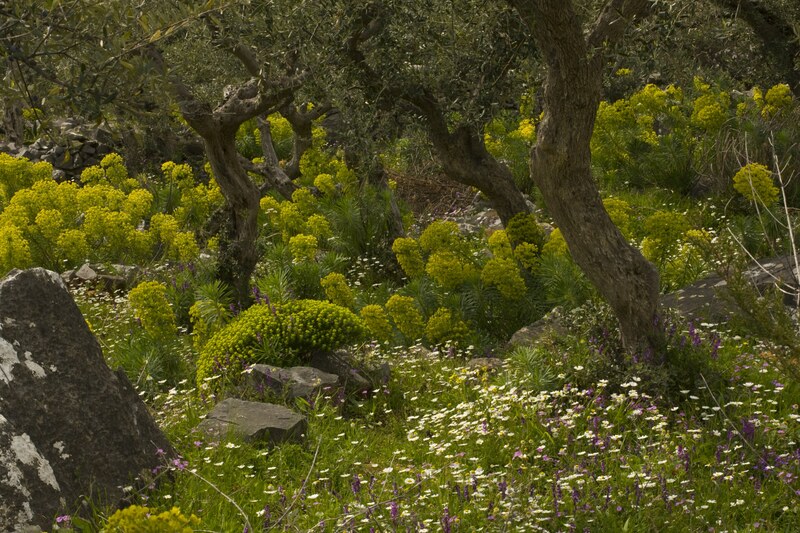 Flowery old olive groves in spring on the Mani Peninsula, Peloponnese, south Greece. Not a great deal has changed in the 25 years or so in which I’ve known the Mani; the motorway from Athens creeps ever closer, and more tourists fly into Kalamata, so it’s become busier and there are more hotels and second homes, though, as a result, the food is better, there are more places to stay, and more crumbling buildings are being saved and restored. Any time in the Mani is beautiful, but, I’d go in spring for the fabulous flowers, the spring sunshine and the lack of crowds. Bob Gibbons is the author of Wildflower Wonders: The 50 Best Wildflower Sites in the World, available in paperback from May.